Tissue engineering is turning into a very powerful tool to learn about biology. We haven’t quite figured out how to grow full sized replacement organs, but we’re able to cultivate miniature versions on a chip. 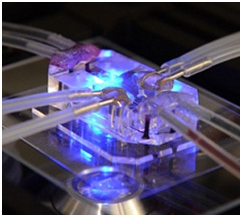 These organs-on-a-chip are poised to revolutionize and fast-track drug discovery and development. Already a new lung-on-a-chip, developed by NIH-funded investigators at the Wyss Institute in Boston, MA, is a game changer. This nifty little thumb-sized device offers a new way to model human diseases, and a cheaper and faster way to screen potential drugs. Currently, molecules that are promising drug candidates are tested in test tubes or Petri dishes, then in animals, and then, if they’re successful, in a series of human clinical trials. It’s a long, costly process that, on average, takes about 14 years from discovery to clinic with a price tag of up to $2 billion. To further complicate matters, what works in mice or monkeys isn’t always an accurate indicator of what will work in humans. In fact, only about 10%  of drugs that work in animal trials are ultimately successful in humans. That’s what makes this new paper  just published in Science Translational Medicine so exciting. The researchers are creating representations of living human organs outside living humans, which may eventually better our understanding of disease processes and also reduce our dependence on animals for testing. The new lung-on-a-chip is designed like a sandwich to mimic the interface between the lung’s bubble-like air sacs (called alveoli) and tiny blood vessels (called capillaries). At the center of the chip is a flexible, porous membrane. One side of the membrane contains a layer of lung cells that make up the alveoli; the other side has a layer of human cells that line capillaries. A channel above the lung cells allows air to flow over the cells just as it would in the alveoli, and a second channel below the capillary cells carries a blood-like liquid. When intermittent suction is applied to the chip, the cells flex and stretch rhythmically just as they do in our lungs when we breathe. The researchers’ goal is not just to create a good mock-up of the lung, but also to model disease processes. In the latest study, the disease was pulmonary edema, a serious health condition in which fluid from the blood vessels leaks into the air sacs making it difficult, if not impossible, to breathe. Heart failure and an immune protein called interleukin-2 (IL-2), which is also used as a cancer drug, can trigger this condition. The researchers pumped IL-2 through the blood channel on the chip at a concentration similar to that used in cancer patients. Over the next four days, they saw liquid leak through the capillary cells, cross the porous membrane and completely flood the air channel—the chip version of pulmonary edema. When the cells in the chip were examined, clots of blood proteins were found caked on top of the lung cells. When the chip was flexed to simulate breathing, the leakiness increased three-fold, making the situation worse. This is something that would have been very hard to appreciate in an animal model – you can’t ask the animal to stop breathing! The researchers then tested a potential new drug, GSK2193874, which could be given to cancer patients to prevent the pulmonary edema induced by IL-2. They saw that the drug completely prevented leakage in the lung chip, just as it had done in rat and dog trials. Amazing! This same team of researchers has also created kidney, bone marrow, and gut chips. And there’s more in the pipeline. We at the NIH, in collaboration with the Defense Advanced Research Projects Agency (DARPA) and the Food and Drug Administration (FDA), have launched a 5-year, $140 million program funding the development of additional types of tissue chips, including liver and heart. These chips not only hold promise for testing whether a drug works, but if it is potentially toxic and at what concentrations. Just think, if we can eventually link all these organ chips together in a functional way we may even be able to produce “You-on-a-Chip.” The remarkable new science of induced pluripotent stem cells (which are derived from adult cells) could make it possible to convert your skin cells or blood cells into multiple different cell types. If we loaded these onto a biochip outfitted with appropriate readouts, it could rapidly test what drugs just might work best for you! Bioengineering. Lung-on-a-chip breathes new life into drug discovery. A Human Disease Model of Drug Toxicity-Induced Pulmonary Edema in a Lung-on-a-Chip Microdevice. Huh D, et al. Sci Transl Med. 2012 Nov 7;4(159):159ra147.